A wave of protests and popular discontent hit the Islamic Republic of Iran at the turn of the year. The protests started on December 28 in Mashad, a bastion of clerical ideologues and political hard-liners. The popular movement is centered around the opposition against president Hassan Rouhani and his economic policies. The protests started in reaction to the sudden increase of the price of eggs, but the underlying causes were mainly the poor performance of Iranian economy, economic inequality, inflation, rising prices and high unemployment – especially the youth unemployment. Rouhani was re-elected in May 2017 when he ran a campaign centered around economic reforms to boost economic growth. But so far little has been done and his 2018 budget announced in December 2017 largely motivated the current discontent. The message has since been hijacked and readjusted at will across Iran, mainly by people outraged by economic hardship. The protesters are united under the chant: “No to conservatives and reformers alike” and “death to Rouhani”. Rouhani’s government responded by force and by shutting popular social-media apps, such as Telegram, which has been used to organise rallies. Until now the clashes with security forces claimed at least 21 lives. The protests naturally gained international attention, with President Trump and his Vice President Pence poking the regime on Twitter. French president Macron asked Rouhani in a phone call to show restraint a postponed his foreign minister’s trip to Iran. The U.S. meanwhile requested UN Security Council meeting to show support for the “anti-government protesters”. The current situation compares to the, similarly large, 2009 protests. But while in 2009 the protesters were mostly urban upper-middle-class led by common leadership in Tehran, today the riots appear to be without common leadership and erupted outside of the capital. The situation seems to have mostly ebbed away by now, yet the issue is far from resolved and the government needs to come up with a solid response. Current Situation in Catalonia? A Stalemate. Last October saw a failed attempt by the autonomous region of Catalonia to win its independence from Spain. Madrid called the referendum illegal and attempted to suppress it by force. Following the crackdown, Spanish PM Mariano Rajoy called a regional election for December 21 and hoped that a defeat of pro-independence parties would resolve the Catalonian problem. However, the results of the election did not really solve anything. Although the formal winner is the pro-unity party Ciutadans, the three biggest pro-independence parties received enough votes to form a government on their own. The result also speaks volumes about the polarization of Catalonian society, which for now seems incapable of making up its own mind. On the other hand, the Spanish government is also unable to propose an acceptable solution to the Catalonian question that became Spain’s chronic pain in the last two decades. For now, the upcoming challenge for Catalonia will be to form a stable government. The struggle for independence had an explosive start in October, but it only really just began. In his first tweet of the year, the U.S. President Donald Trump is again stirring the international waters. It is not clear what inspired the tweet in which President Trump accused Islamabad of “lies and deceit”. It comes only five months after current Pakistan’s prime minister Shahid Khaqan Abbasi assumed office. The official response has not yet been published, although it has been reported that an emergency meeting amongst leading Pakistani officials has been held. There has, however, been a strongly worded response by Khawaja Asif, Pakistan’s foreign minister, who said that the only reason President Trump is accusing Pakistan is his frustration with the inability to win the war in Afghanistan. Later in the week, the Trump administration blocked an estimated $2 billion in military aid for Pakistan. In response, Pakistani officials described the US a “friend who always betrays.” The relationship between the two countries has been steadily deteriorating since Trump came to power. However, the discontent with the partnership is nothing new in the Washington establishment. Stopping all American aid would bring “a period of difficulty“, but it would by no means lead to a collapse of Pakistan’s economy. What stopping the aid could cause, however, is for Pakistan to seek other foreign allies, such as Russia or most likely China. 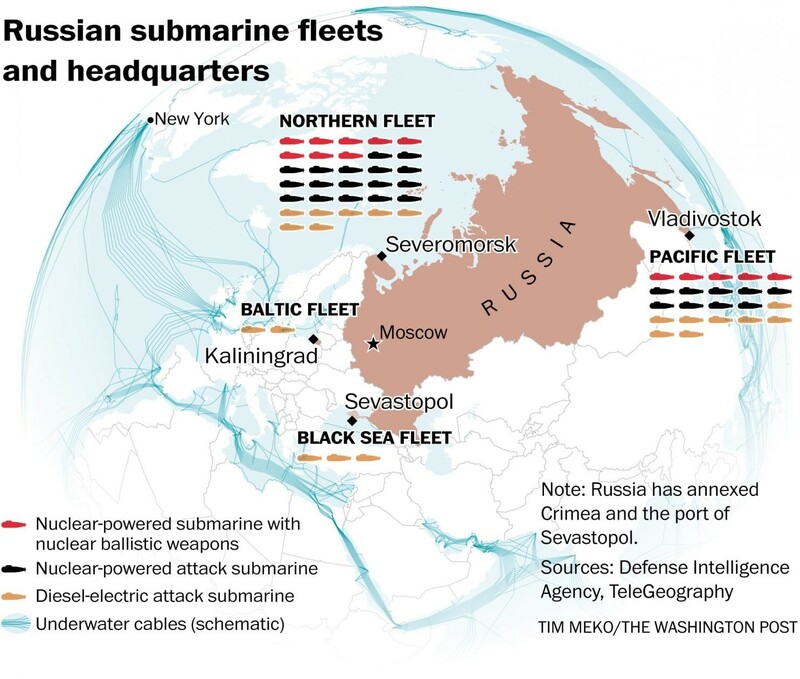 Russian submarine and naval activity have been observed near the undersea internet cables and many are worried about the possibility to cut these cables off. Around 97% of the global communication is processed by the undersea cables. Although, it is also plausible that Russians are simply tapping into the cables to intercept the communication and gather intelligence. That would not be such a big deal as the Americans and the British have done that for years. Be it as it may, the undersea internet cables still remain a vulnerable piece of NATO’s critical infrastructure. Talking about critical infrastructure, Houthi rebels in Yemen have been disrupting internet access for the whole country. This complicates situation not only for the Yemeni citizens, who cannot access news or messaging services, such as WhatsApp but also for humanitarian workers in the country. Despite the general uneasiness about the Russian interference in the US elections, Trump administration has reportedly turned down a sweeping bilateral non-interference agreement that would prohibit both governments from meddling in each other’s domestic politics. This came despite the US intelligence community’s warning that Kremlin-directed meddling in the US will only grow more sophisticated. Yet this decision is understandable by a complicated US political environment in Washington and the lack of faith in Moscow. Lastly, one of the more devastating cyber-attacks of the last year WannCry ransomware, which locked more than 300,000 computers in 150 countries, including parts of the British National Health Service (NHS), has been publicly attributed to North Korea by the U.S. Homeland Security Department. Although it has been rumored for months, the reason it has been done in December might well be seen as an attempt to paint North Korea as a global threat.